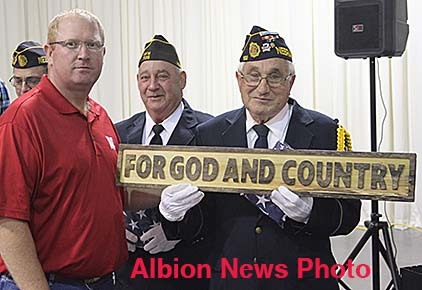 Chad Martinsen, left, presents an engraved wooden plaque to veteran Harold Miller of Albion. Boone County Friends of the NRA provided some special honors to area veterans during their annual banquet Saturday evening, Nov. 5, at the Boone County Event Center. After presentation of the colors, all veterans present were asked to line up at the front of the hall. American Flags, courtesy of the Modern Woodmen of America, were then presented to each veteran. An engraved wooden sign, “For God and Country,” was then auctioned and presented to the oldest veteran present. The sign was presented to Harold Miller of Albion, age 85, by Chad Martinsen of Elgin, an officer of Friends of the NRA.